Death at Dawn has got under the skin of Jennifer C Wilson! Only three more performances left plus a school matinee! After seeing the premiere of Death at Dawn’s second run on Friday, I feel like I’ve not been away from it! I never saw that production, but in both the Wallsend Memorial Hall and the Discovery Museum’s Great Hall, it has been fantastic to see. And, having watched it three and a half times in eight days, I feel slightly qualified to say so! I’m also delighted to have had my review of the play in this week’s News Guardian. It’s been lovely helping out, and you still have three more opportunities to see the play, until Wednesday evening, at the Discovery. And now? Now I’m just looking forward to the next Cloud Nine production! At dawn one hundred years today, a North Shields soldier was shot for desertion by members of his own platoon in a French abbatoir. The teenage solider was young William Hunter sentenced by court martial to death for leaving his post in order to spend time with a local French woman. 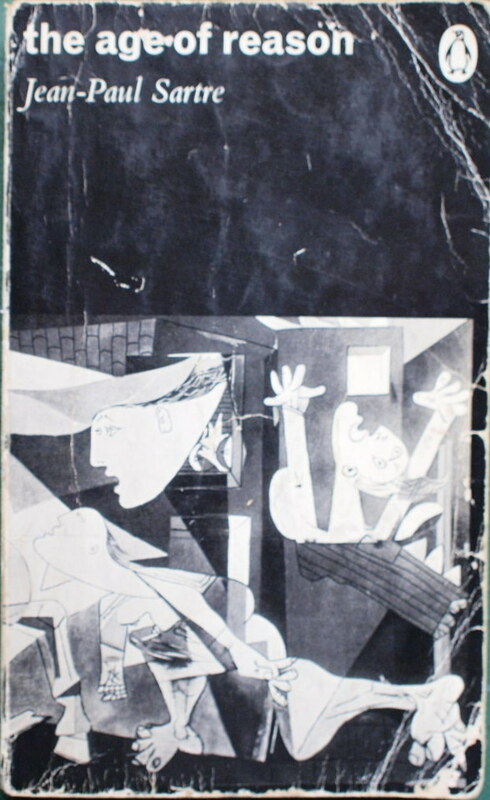 “I did not like to leave her,” he stated in his written defence, seven words which sent my chum Peter Mortimer on an a train of thought resulting in his play Death at Dawn. This award-winning play started its revival at Wallsend Memorial Hall on Friday night and there were two performances yesterday: matinee and evening. I’ve been involved in ticket selling, publicity and liaising with local schools for Death at Dawn since autumn. It’s been hightly moving to watch the performances (and audience reaction). All credit to Pete, director Neil and his production team including lighting, costumier & actors of course all working to recreate what original director Jackie realised with 2014’s first performances. 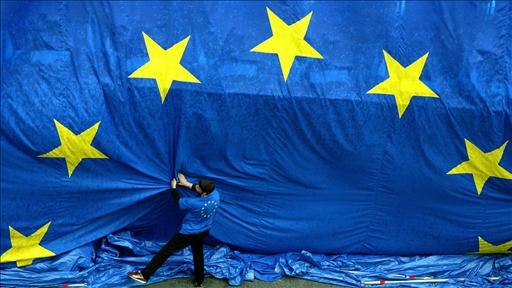 Sadness for Jackie who died last year, William Hunter (and his family) mingle with thoughts of what Europe was like 100 years ago, where it went in the 20th century and what will happen after Britain’s EU referendum in June. 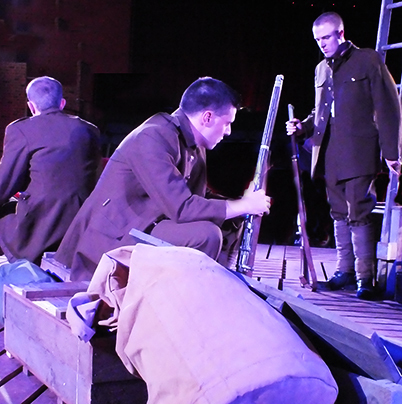 If you want your thoughts provoked then catch Death at Dawn at Wallsend’s Memorial Hall tomorrow and Tuesday and from Friday 26th at Newcastle’s Discovery Museum. 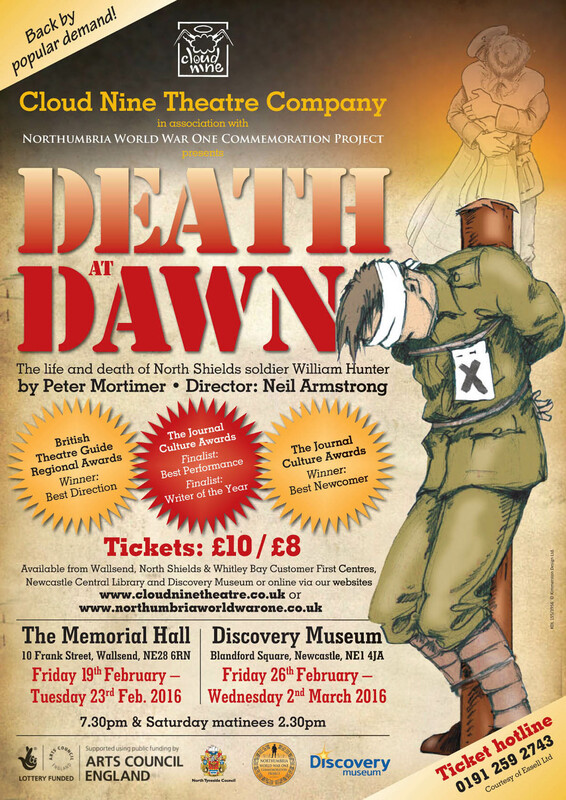 Next Friday (19th February), I’ll be heading along to Wallsend Memorial Hall to see Death at Dawn, a play by Pete Mortimer of Iron Press, based on the real-life story of young North Shields soldier, William Hunter, who was executed for desertion in 1916, in France. This powerful, controversial and emotionally charged play picked up two regional awards (including a Journal Culture Award) and was short-listed for two more after performing to packed houses in North Shields’ Linskill Centre in September 2014. It will be staged at Wallsend Memorial Hall 19th -23rd Feb then in the Discovery Museum’s Great Hall from 26th Feb to 2nd March. There are evening and Saturday matinees performances plus special half price weekday matinees for schools. I’ll be running another Haiku workshop on Tuesday 12th April from 7pm to 9pm in Whitley Bay. Before that one there will be the Writing the Unwritten workshop on Thursday 3rd March from 7pm to 9pm in the same space, Boo Boo and Ted in central Whitley Bay. Man, I get so much out of co-running Poetry with Friends. 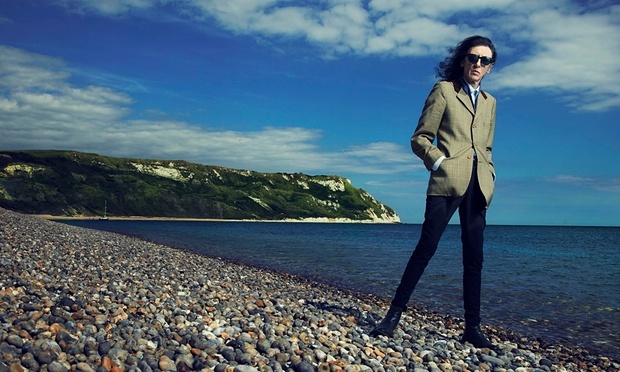 Thursday’s session in Whitley Bay library was meant to be about Love and its opposite but we went all over the place with Ogden Nash, Roger McGough, John Cooper Clarke, Thomas Hardy, Christina Rossetti, John Masefield, Barrie Horn, Stevie Smith, Seamus Heaney & Dylan Thomas. We also talked about Hawaiian drug dealing, being mistaken for a terrorist and a murderer, cycling, running, the joys of retirement, New Year resolutions and homelessness. Gail and I are asking our Happy Planet gang to send us their top five poems of all time so we can compile a list. I worked out mine during Thursday’s session. Just sent it to Gail now. I’m happy with my choices. Last night, I attended a haiku workshop run by my good friend and fellow Whitley Bay writer Elaine Cusack, through Happy Planet Creative Arts CIC. As I have repeatedly said in this blog, I love workshops, and although I’ve attended a haiku workshop before, I’ve never quite got the hang of them, and was looking forward to learning something new, and, hopefully, generating some new pieces. 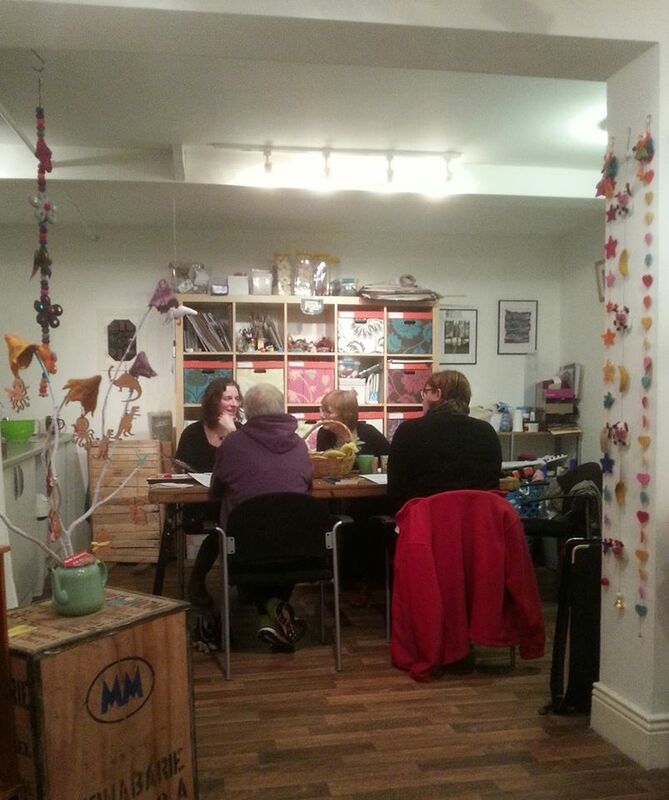 Our Happy Planet workshop space – lots of inspiration!